This page is an index to an ongoing series of quick reviews of the Sherlock Holmes stories by Sir Arthur Conan Doyle. The reviews concentrate primarily on the quality of the story and the quality of the mystery contained therein – if indeed such a mystery actually exists. As someone who has in the past been put off Holmes due to his habit (in my eyes at least) of making deductions based on facts not given to the reader, I’m reading some of these for the first time. The reviews will be done in an entirely random order, for no particular reason. ** There are two different orderings to the stories in The Case-Book. I have chosen the ordering that appears in the original versions as opposed to the more recent editions. Where there are, apparently, different titles for some stories – for example The Reigate Puzzle and The Adventure of the Reigate Squire, I have chosen the version that is in my copy. don’t like “The Illustrious Client,” which has always been one of my favorite Holmes stories. My favorites (beside the ones I’ve mentioned) are, without much originality, “A Scandal in Bohemia,” The Red-Headed League,” and “The Speckled Band.” Anyway, any interest in the novels? The Hound of the Baskervilles is brilliant not as a mystery but as a novel — superb! — and The Valley of Fear is absolutely brilliant, creating a solution off of which probably every mystery author has written a variation. Well, thanks for this great blog — these will hopefully make one remember the Golden Age of Detective Fiction. 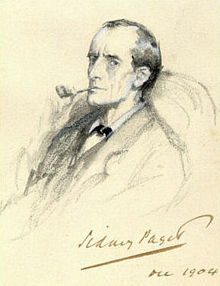 My little contribution is “Yet Another Mystery Blog.” Do well with Holmes! Thanks for the kind words – I do need to get back to Holmes. It’s been a while. As for the novels, Hound is unlikely simply because I’ve seen so many versions of the story that I know the plot inside out. The Valley of Fear is more likely as I don’t know anything about it.